It was well over 20 years since we were back in the Islands for Christmas and New Year. It was always a summer trip, with The Girl off for three months she would spend a good portion of it in Hawaii getting to know her granny, uncles, aunts, cousins and family friends. Now in college, she has a pretty long winter break so we decided to spend the holidays in Hawaii with the rest of the clan. Unlike the mainland, Hawaii’s weather is pretty stable for most of the year. However, “winter” in the islands usually means a bit more rain and “colder” temperatures--in the lower 80s or mid to high 70s. For thick-skinned former islanders arriving from Northern Virginia, where the highs were in the mid-30s, Hawaii’s winter is really nothing to be bothered about. However for those who live here, it can be very uncomfortable. 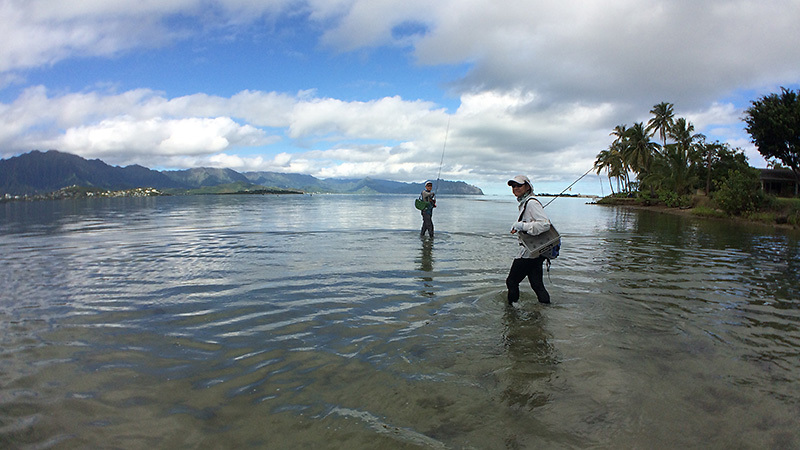 It wasn’t unusual for my fishing partners to be wearing wetsuit tops and jackets as we pursued bonefish on the flats. Fishing started out at it’s usual awesomeness as I fished with Eric and SteveT at one of our favorite spots on the flats. I walked close to SteveT as we waded out to our first fishing spot so I could absorb some serious good luck mojo from his aura and it worked. 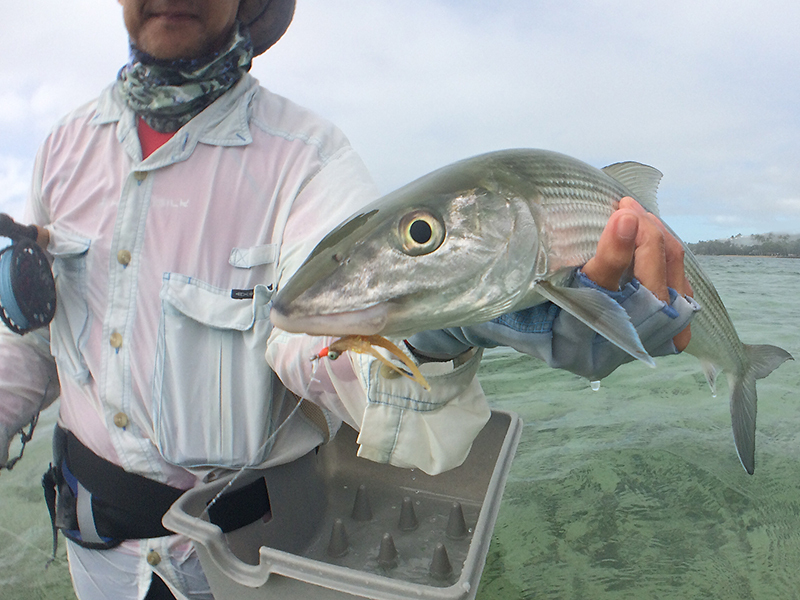 I hooked up with a decent bonefish that pulled some serious line before coming to hand. However, over the following days, and stretching into the coming weeks, there was a troubling pattern developing with our hooking and landing that seemed to be related to the developing weather pattern over the state. For the first couple of days we hooked and landed four bones and lost a couple more during the few hours we fished on the flats. The next couple days it was three. Then two. Then one. Finally none. A high pressure weather system was just sitting off the islands and this was bringing in bands of rain, heavy overcast skies, high winds and much colder temperatures. The rain made things a bit uncomfortable but, as I told Eric, “it wasn’t snow.” I didn’t mind being wet because it was just mostly passing showers and as soon as it stopped, within 20 minutes I was dry again (the wicking of 3XDry and Goretex shirts are simply amazing). 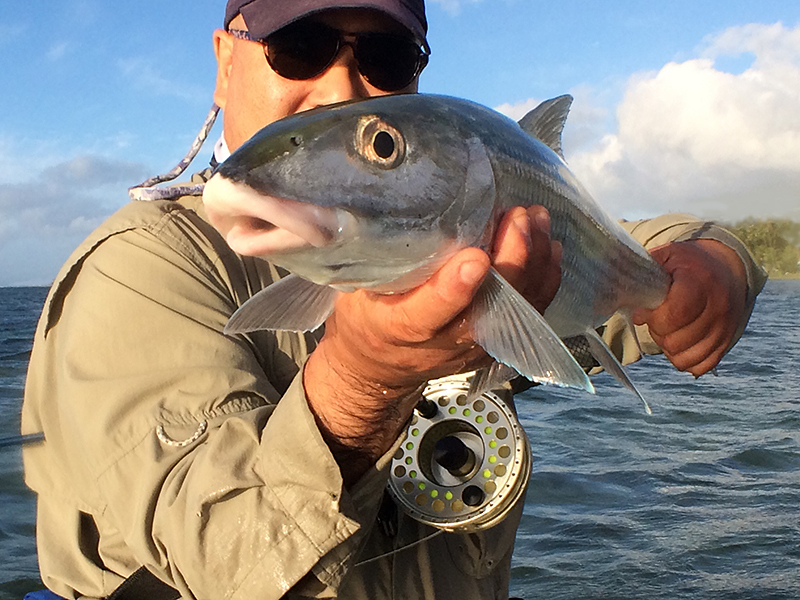 The wind made things tricky with casting--shorten the leader and watch out how you’re slinging those heavy lead eye flies. 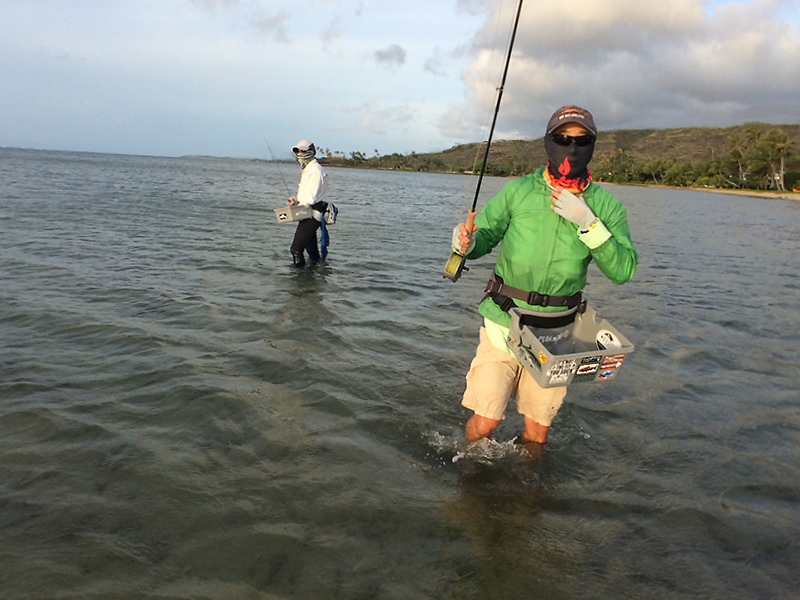 But it was the colder water that really shut down the fishing. One morning Eric and I were heading to fish a spot on the southwest shore. It was a heavily overcast morning and there was a stiff breeze blowing in from the east but when I stepped into the water I immediately noticed that the water was REALLY cold. We didn’t get a bite all day fishing a spot where we usually hook several bones (or at least one). 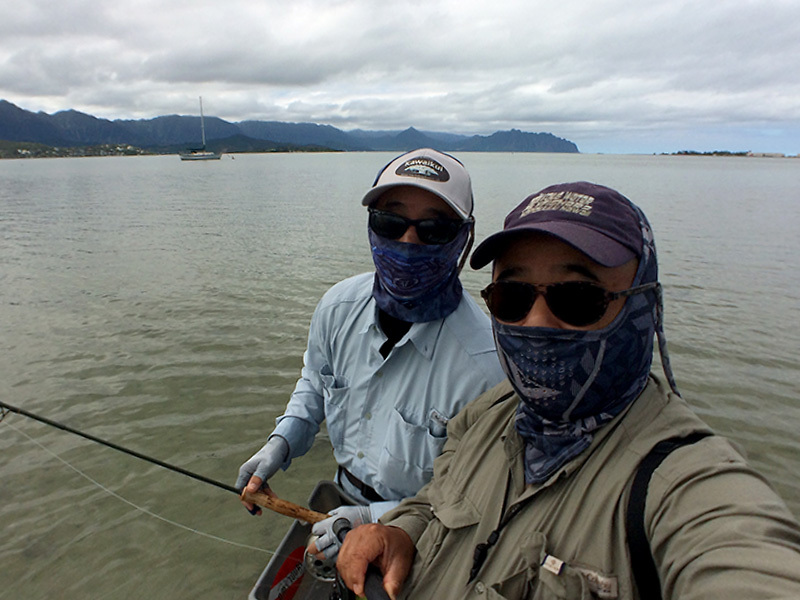 Checking in with the folks at Nervous Waters fly shop in Kaimiki reinforced the premise that the cooler weather and water was affecting the bonefish bite around the island. However we continued to fish. I went out almost every day with either Eric or SteveT and if they weren’t available I went solo and tried some different locations that we don’t often fish. Nothing. The cold water was causing lockjaw on Mr. Bone. At one particular location I watched eight fly fishers strung out along the coast and nobody hooked up with anything. Pretty sad but that’s fishing. Better luck, and weather, next time. EQUIPMENT: We used medium fast to fast action rods in the 7 to 9 weight range. Our reel selection included Lamson, Nautilus and Tibor, lined with Rio Tropical Outbound Short, Rio Bonefish, Scientific Anglers Bonefish or Monic All Weather Covert Clear lines. Leaders were between nine to 12 feet long but cut back shorter, sometimes to five feet, when the wind really picked up. Tippet was 18 inches of 20 pound fluorocarbon.